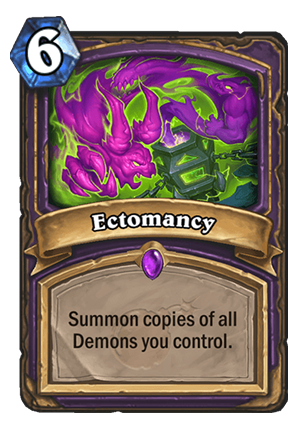 Ectomancy is a 6 Mana Cost Epic Warlock Spell card from the The Boomsday Project set! The card has a very high potential, but it’s also difficult to make it work. It’s a 6 mana spell, which does nothing by itself. If you play a deck like Cube Warlock, which this might fit into best, most of the time your opponent tries to deal with your big Demons anyway, so you won’t Carnivorous Cube them. Or well, Faceless Manipulator them. If one Demons sticks, then Faceless is just better – it does the same for 1 mana and is more flexible, because it can copy non-Demon cards too. 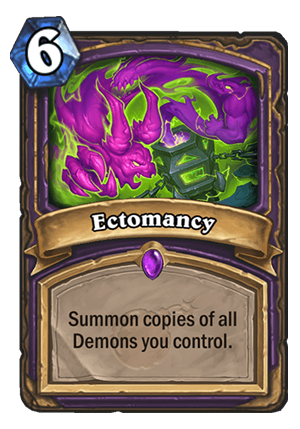 On the other hand, if you get a board with a few Demons sticking, then the only thing that can save your opponent is a massive AoE clear anyway, so this might not be that good. Like, if you play Gul’dan and your opponent doesn’t clear, then you a) probably don’t need more damage and b) probably don’t have space on your board anyway. Remember that it can’t summon more than 3 Demons anyway, because you’re limited by board space. The best case scenario is having something like two Doomguards sticking and then playing this for 2 more… but that would rarely be relevant. So I don’t believe that it will be played in something like Cube Warlock. Maybe as a Bloodbloom combo? Like, you drop Doomguard from Skull, Faceless it, then play Bloodbloom + this… 20 damage in total. But pretty situational. Maybe in a Demon Zoo Warlock kind of thing? 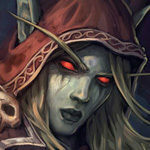 If you would consistently have a few Demons on your board, having a way to duplicate all of them could be nice. Again, especially with Bloodbloom. You don’t care that much about damage anyway, and if you could let’s say copy a Flame Imp, Vulgar Homunculus and Despicable Dreadlord for 2 mana, then it would be pretty nuts. The card has some potential, but at 6 mana it seems expensive, and the Bloodbloom would most likely need more targets for it to be worth it. So it might be difficult to make it work. I love it 2.5/5 in standard (maybe worse) and 4/5 in wild because you krul malganis voidlord and dublicate all three! Nice plan. 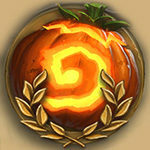 Wait maybe there van be an otk deck with bloodblom in wild.Now i am verry interested in the card!!! !double bloodblom!!! 6 mana and requires having board with over 6 mana worth of demons in it. Seems little too greedy but might worth with skull. Right when you thought you only had to deal with two voidlords, now you have to deal with 4. If you can’t deal with two voidlords you already lost. That’s just objectively untrue, half the tier 1 decks right now couldn’t care less if you have two voidlords on the board. 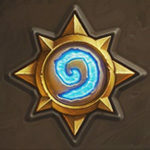 Can work in cubelock, renolock, and control variants. 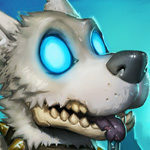 This is the warlock Volazj(somehow) haha. Yeaaaah I don’t know, too greedy.